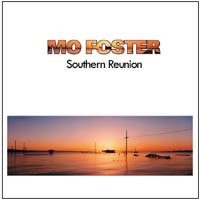 It wasn’t until 1988 that any of these personal compositions entered the public domain with the acclaimed album, Bel Assis, (SJPCD151) Mo Foster’s debut solo recording. Two years later Southern Reunion continues what Bel Assis started as the second collection of observations and ideas by one of Britain’s finest bassists. But typically for Mo Foster this is no album of bass machismo, “I didn’t want just another bass album. I wanted it to be more compositional to give space for the other soloists to work in – to create a backdrop for their own ideas”. The backdrops which Mo Foster created clearly provided all the inspiration needed for the phenomenal gathering of soloists on Southern Reunion. Gary Moore’s blistering guitar on the Evans tribute, ‘Gil’, was recorded in just one pass, as was Ray Warleigh’s soaring flute on the Celtic ‘Achill Island’. ‘Gil’ also demonstrates the brilliance of Gary Husband’s drumming, while ‘Blue’ provides the perfect colour wash for Frank Ricotti’s vibraphone.